The front of your house is what everyone sees, so you want it to stand out. The secret to the perfect balance between concrete and plants is a much-desired one and can turn your front yard into a gorgeous oasis for all to marvel at. You don’t need to have a large front yard to achieve this goal either, you can achieve a beautiful front yard with even the smallest of spaces as well with the right amount of planning, so let’s jump into it. Water wash – Probably the simplest way to achieve the exposed aggregate finish, it involves blasting the concrete with water and then scrubbing with a broom until the desired effect is achieved. Sandblasting – This process can dull the colours and overall appearance of the exposed aggregate but creates an even and constant finish. Once the concrete has hardened, it is sandblasted – that is, blasted with sand through compressed air. Pavilion finish – This final technique involves an acid solution that is applied to remove cement from varying depths, creating the exposed aggregate effect. 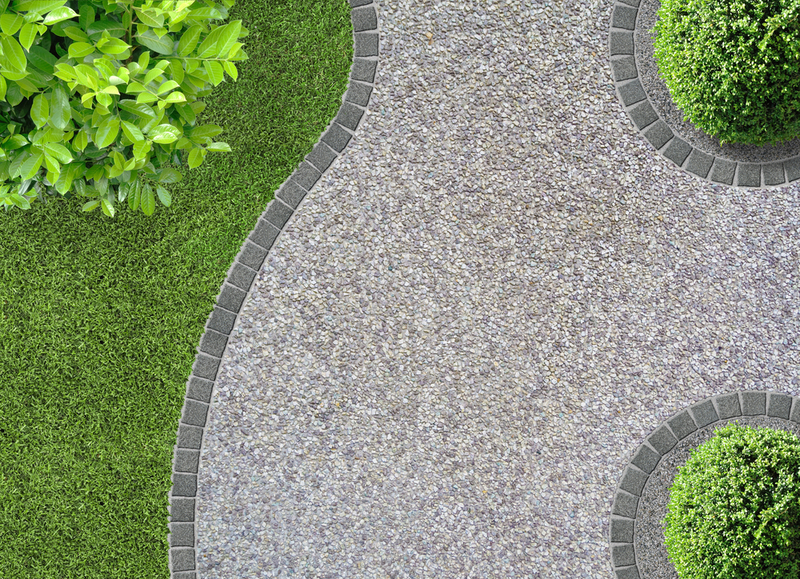 Now that you have your exposed aggregate driveway it’s time to select which parts of your front yard you want to have grass or plants in them. This is something that can be changed later but it is much easier to plan ahead. We recommend having a grass patch separate to your garden area. This can be multiple small areas or even just one large patch. It’s always nice to have some grass in the yard, especially if you have a pet who will enjoy the grass more so than complete concrete – and you don’t want your pet getting into your garden patch. If you’re still not sold on the idea of a grass patch, then why not create a small, pebbled section in the centre and place a water fountain – or other water feature. This way you still get that classic front yard look, but with a bit of an art décor/modern touch. Borders are a great way to make a statement and add an extra layer of design and aesthetic to your front yard. You could choose to just have your grass patch(s) and flowerbed(s) blend into one, but we think that establishing a clear, physical barrier between the two sections not only adds protection but also improves your gardens look. The same can apply for the edge of your grass/exposed aggregate driveway. Whether it be a small shrubbery or small fence of some kind (using stones and pebbles is a fantastic idea as well) it looks great to section parts of your garden off. You can also plant small flowers along the border of your grass and concrete driveway and then add lights in between for a dramatic effect in the evenings. Selecting plants to match the vibe of your front yard can be an arduous task. The easiest thing to do is just select whatever flowers or plants you think would look nice, creating your own unique vibe. But if you want to go above and beyond, you can look at the colour of your house’s exterior, your driveway, fence etc. and try and match your plants to those – whether they’d be the same colours or something completely different in contrast. We’d recommend something contrasting. For example, if your exposed aggregate driveway has more of a blue finish to it, then green plants would look great in comparison. Then when you factor in the green patch of grass you may have, something a bit brighter like red or orange would complete the look. Alternatively, you could create a sea of red with the Pyrostegia trumpet vine and have blue spots appear every few centimetres with the Agapanthus Bingo Blue. This would create a warm, summery vibe for your house all year round. A Better Driveway are friendly concrete specialists based in Campbellfield with years of experience laying down exposed aggregate all around Melbourne. We’d be happy to answer any further questions you may have or offer any advice you may need on crafting your front yard. If you would like to get in contact with us then please call 0393 086 112 or fill out the form on our website.